If you’re considering retirement communities in the vicinity of Orlando, Florida, with an eye toward calling one of them home, make sure you don’t overlook Hyde Park. 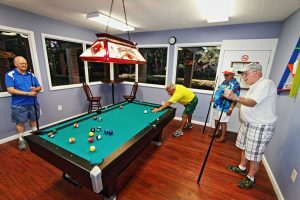 We’re a community for adults 55 and older that emphasizes an affordable active lifestyle along with the quiet comfort of living just outside the hustle and bustle of the Sunshine State’s top tourist destination. Plus, unlike many retirement communities, Hyde Park provides lawn mowing for residents along with community grounds keeping services, all included in the low price of a monthly home site lease payment. That means you’ll have more time to enjoy the activities and neighborly camaraderie that make retirement communities a lifestyle of choice for many older adults. We’re also a pet-friendly community. To find out more about Hyde Park and how it stacks up to other retirement communities in the Orlando, FL, area, contact us today. We’ll be happy to schedule a tour for you when you’re in the area.